The vast majority of aches and pains around joints are simply caused by tight muscles. There are a multitude of therapies and methods of solving these problems but I have found that simply stretching the relevant muscle is very effective and this is the method that I'm concentrating on here. Of course, it is possible to have real damage in a muscle, particularly if you are a trained sportsman using the muscle to its maximum. Then there is damage, which does not come into this category and needs more specialist attention. 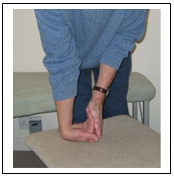 However, for most of us these therapeutic stretches will be very effective in solving joint problems. By this I mean cases where the mobility and use of the shoulder is reduced particularly in trying to put objects above head height. Such shoulder problems can be very persistent and painful and most therapists find them very difficult to solve. This stretching method is far more successful than anything else I have tried as a therapist. Lie on your back on the floor with your hands by your side. Keeping your arms straight, slide your hands out along the floor till the arms are above your head with your shoulders alongside your ears. 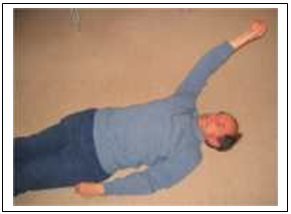 If you have the sort of shoulder problem I am talking about then you will not be able to do this with the bad shoulder and will have to take the arm off the floor to get it above your head. Now move the painful arm backwards and forwards in the arc of movement when the arm is off the ground. Choose the point in this arc of movement, which causes maximum pain in the shoulder. (This shows that we are stretching the right part of the problem muscle!) Now let the arm sink back to the floor for five minutes. You can start with 20 or 30 seconds but the real benefit will come when you can really let it sink back to the floor for a full five minutes. This will be painful in the shoulder and you will have difficulty in getting the arm down by your side again afterwards but persist with this exercise a couple of times a day and you will solve most shoulder problems in a couple of weeks. This can be used with a frozen shoulder, which is simply an extreme form of multiple muscle tightness around the shoulder, but the pain level may make this impossible. It should anyway be a useful technique to use in order to get back to full mobility when the real frozen phase has been solved. Obviously anyone with a shoulder problem should be doing all the upper body daily stretches. Obviously anyone with this problem should be doing all of the daily stretches particularly the wrist extensor and flexor stretches. The general principle that I apply to knees is very similar to the general principle I apply to shoulder problems. Most shoulder problems are caused by tightness in the pectoral muscles. Most knee problems are caused by tightness in the quadriceps or other components in the front of the knee. The knee is designed to spend significant time bent through 180° when squatting with heels on the ground. Most of us never squat and probably never bend the knee this much. However there are differences. You can be very firm with the shoulder to restore the mobility. The knee is far more likely to have real damage. There may be cartilage or ligament damage and even if there isn't, knees have a great tendency to swell up for no apparent reason. If the knee is swollen then obviously extra care is necessary. I have had a great interest in knees, because of my skiing, even before I became a therapist and good success recently in treating knees with these stretches. I have two main stretches for the knee. The quadriceps stretch is the normal one pulling the ankle up towards the buttock. This is best done lying on your tummy because you can't cheat by bending the hip and you can hold the stretch for far longer in this position. I believe you should be able to get heel to buttock fairly easily. Most people can't. If you can't reach the ankle then you wouldn't be able do so in the standing position either so use a bit of string or cord around the ankle. This is simply to bend the knee through 180° when the hip joint is flexed so that the quadriceps are loose. This could be done by squatting, which is the natural way that this mobility would be maintained or by sitting on the heels as children do. 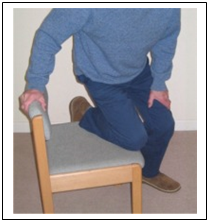 If the front of the knee is tight you won't be able to do this and the stretch has to be done from the standing position with the bad knee bent on a chair. In this way you can control the amount of bend and pressure put on the knee. Try to get to being able to sit on the bent leg.